Here are a number of links to articles, websites and videos on the subject of collective impact initiatives and approaches. Shanna Ratner: Her You Get What You Measure workshop. This article from the NY Times is relevant to discussions on improving childhood outcomes. In a nutshell, if we want to improve test scores, we need to reduce family poverty. How sites have “failed forward”. The FSG website, has excellent resources on Collective Impact (as well as Shared Value), with several examples. Memphis has a complex collective impact project called Memphis Fast Forward, with 5 initiatives. This picture is just one attempt to show the ongoing work to build the new system. But what will the system really look like? That’s an open question – and we want to know what you think. Tell us what’s missing from the picture. New economies are locally rooted, and here at IPS Boston we root our work in our own backyard – the diverse Boston neighborhood of Jamaica Plain. 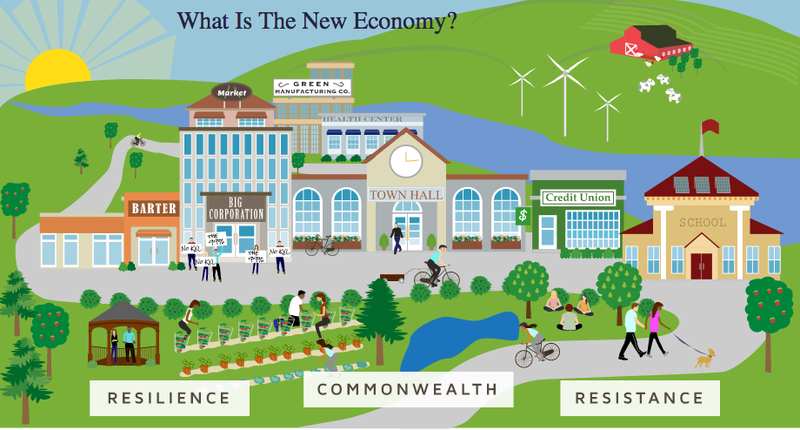 That’s why for the past three years we have supported the Jamaica Plain New Economy Transition. We also recognize that local economies are nested within larger systems, so we support work to enhance the resilience of the New England region. Interested? Click here to receive regular updates about IPS New England’s new economy work. Collective Impact is a change strategy that began spreading with an article by John Kania and Mark Kramer (from FSG) in the Winter 2011 issue of the Stanford Social Innovation Review. Collective Impact is the commitment of a group of actors from different sectors to a common agenda for solving a complex social problem. Collective Impact is best employed for problems that are complex and systemic rather than technical in nature. Collective Impact initiatives are currently being employed to address a wide variety of issues around the world, including education, healthcare, homelessness, the environment, and community development. Many believe that Collective Impact merits attention as an important model for achieving social and environmental change because, when skillfully managed under the right circumstances, CI has great potential to achieve greater social progress at scale. CI seems to foster collective vigilance (the ability to accurately see and stick with the resources and solutions that best fit our situation), collective learning, and collective action. ○ and the perennial obstacles of local politics. ○ problems with measurement systems — some things are not readily quantifiable; too data driven*; focus on short-term data can trap groups into doing the most measurable activities, not necessarily the right ones*. ● But, according to FSG, “the greatest obstacle to success is that practitioners embark on the collective impact process expecting the wrong kind of solutions”. The process and results of collective impact are emergent rather than predetermined, the necessary resources and innovations often already exist but have not yet been recognized, learning is continuous, and adoption happens simultaneously among many different organizations. ○ c) Experiment with Developmental Evaluation: Finding that traditional forms of evaluation do not suffice to measure and improve complex community change, Tamarack has embraced experiments with Developmental Evaluation “a tool for evaluating complex problems and adaptive solutions”. Referring to complex community change as a mystery, not a puzzle, Mark Cabaj explains, “In a puzzle, if you do your homework and get more data, you will solve the puzzle. . . In a mystery, it’s not so much data as sense making that’s really critical.” Developmental evaluation focuses on the relationships between people and organizations over time, and the problems or solutions that arise from those relationships. Rather than render definitive judgments of success or failure, the goal of developmental evaluation is to provide an on-going feedback loop for decision-making by uncovering newly changing relationships and conditions that affect potential solutions and resources. This readiness assessment can help organizations explore what it would take to undertake a CI initiative, and determine which capacities need to be developed to prepare for and launch a CI initiative.